Being a massive rooftop destination perched on the 43rd floor of a 5-star hotel, you could be forgiven for thinking you were in Saigon or Hanoi. 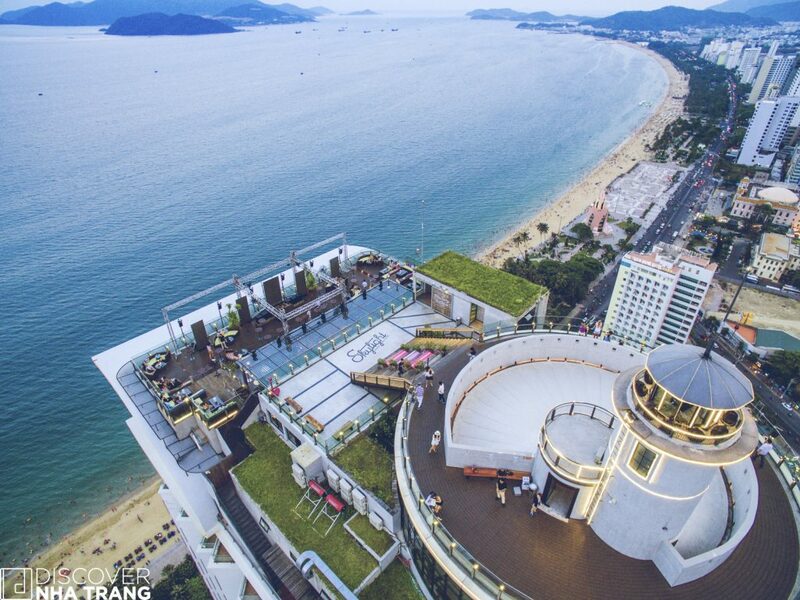 Yet, here in Nha Trang, Skylight has set the bar high, quickly becoming the city’s premier rooftop haunt. At Skylight, it is all about the view. Nowhere else in Nha Trang can you experience the entire region from one vantage point, a complete 360 tour unrivalled in Vietnam. The islands of Nha Trang Bay dominate the eastern vista, the bustle of the city stretches out in every direction below, with picturesque mountains to the west. You can see many of the city’s cultural attractions such as the Po Nagar Temple at the mouth of the river and the huge white Buddha watching over the city at Long Son Pagoda. The scale of Nha Trang becomes apparent and you can take in the breeze and sunshine while grabbing postcard quality photographs. The atmosphere is relaxed as you put your feet up, enjoy the surrounds and while away the afternoon. Step onto the 360˚ Skydeck, and be immediately drawn to the Skywalk, a glass bottomed walkway stretching out over the 43rdfloor, offering incredible views in every direction. Grab a coffee or cocktail and slip into a lounge for that perfect afternoon after strolling around, enjoying the wonderful scenery. Its signature restaurant, Chef’s Club, has been wowing diners with its ‘revolving’ menus from international visiting chefs. 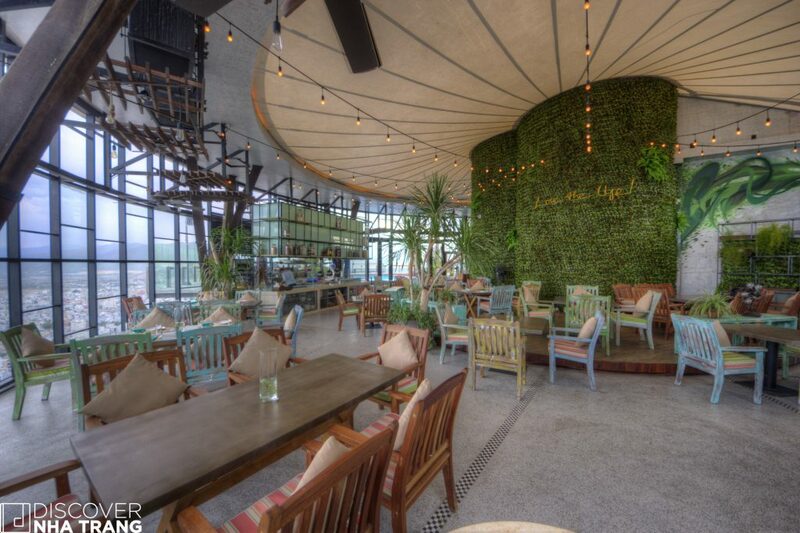 Serving a Pan-Asian menu created by celebrity Chef, Michael Bao, the indoor garden setting is the epitome of casual dining combining undertones of chic and glamor. This is perhaps what is most impressive about Skylight: regardless of your mood, it can morph into what you want it to be. Whether you are just back from the beach and looking for an afternoon snack with a view, seeking a casual but quality dining experience or all glammed up to let your hair down for a big weekend party, you can find it all in one place. The city has long been crying out for a benchmark nightspot, a place willing to set itself apart from the status quo and create an experience that is truly unique. The team at Skylight have certainly delivered beyond expectations. Taking the elevator, a ceiling screen plays video footage of recent raucous nights, getting you in the mood for the playground that awaits as you step out into the highest bar in the city. 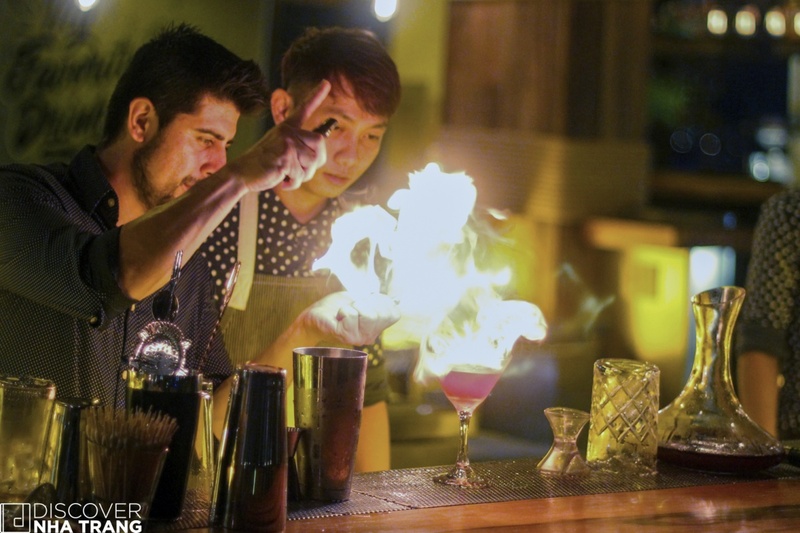 The beach bar is home to a team of energetic mixologists, for whom making a drink is more than a collection of liquid ingredients, but rather a mix of science, art and a huge slice of showmanship. A simple drink turns into a collective experience, and they push the party atmosphere for all the guests who have converged for the evening’s festivities. Skylight boasts of making the best cocktails in Vietnam, and on seeing the team at work through clouds of smoke and bursts of flame as they create the delicious concoctions, it is clear to see that they are masters of their trade. Its image as the party destination of Vietnam has put Skylight on the international map which sees regular events hosted by international DJ’s, hip hop stars from the US along with up and coming acts from across Vietnam. Under the giant lighthouse, weekends at Skylight are home to some of the best night’s out in the country, packed with revelers from all walks of life as they dance and drink under the stars. 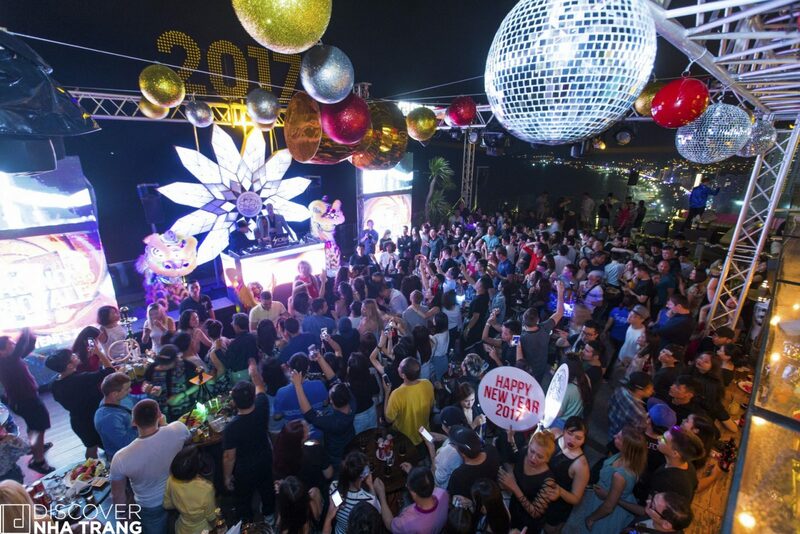 Having become synonymous with being an ‘After Party’ spot, it regularly hosts large community events (the team are dedicated to promote Nha Trang as a tourist destination). 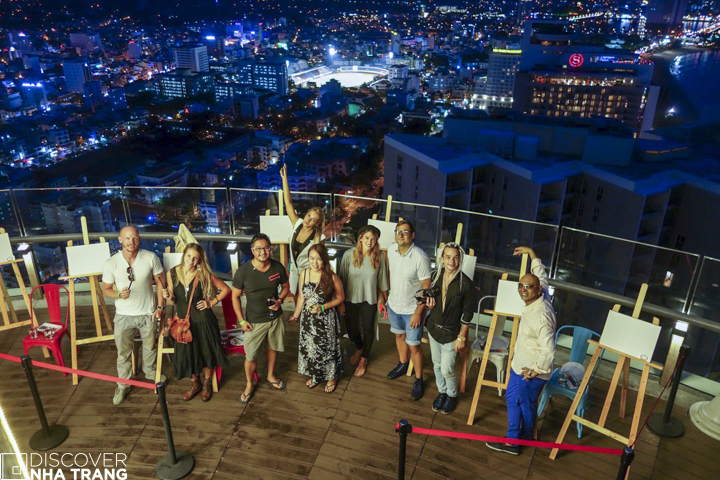 For example, Tripadvisor recently recognized Nha Trang in its annual “Top 10 Destinations on the Rise – Asia”, and the celebrations were hosted at Skylight to great fanfare! Added to this, they regularly host charity events and support young creatives needing a platform to showcase their skills in areas such as as art, design and production. If hard partying is just not for you, fear not, Skylight caters to all visitors and actively promotes a range of themed evenings. Once a month, the venue hosts a ‘Sip N’ Paint’ evening with renowned artist, Sasha Fishler. It commences with some great wine and conversation before she takes you under her wing to help you paint your own watercolor of the city – a wonderful keepsake to take home, and a chance to mingle with fellow tourists, locals and expats. Taco Thursdays has a laidback beach theme with Vietnamese/American fusion tacos washed down with ice cold Corona. A new area, The Corona Bar, is currently under construction on the pool deck and will be the best place in the city to see the sunset. Skylight’s slogan is “Collect Moments, Not Things”, and this is a very apt description of the venue. Whether you are a local seeking a great night out, celebrating a special occasion or visiting the city for the first time, the goal is to create memorable experiences that will leave you with fond memories, new friendships and special memories of Nha Trang.